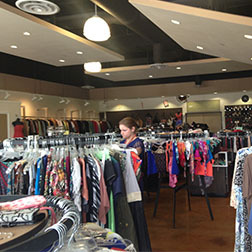 The GW Boutique in Keller is the best place to find name-brand clothing for less. The GW Boutique is an “upscale” experience where customers can find quality merchandise from stores like GAP, American Eagle, Ann Taylor, Banana Republic, lululemon, and more. For more information, please call the GW Boutique at 817-741-6600.